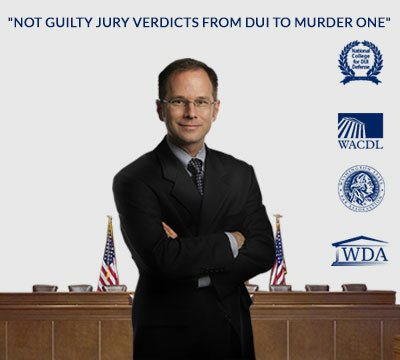 "Not guilty jury verdicts from DUI to murder one"
I'm a respected DUI lawyer with offices in Kirkland and Lynnwood. Whether you've been arrested for your first DUI or your fifth, I can help. DUI arrests face an automatic suspension of your driver's license. I've won numerous DOL hearings, find out why. I have considerable experience and a passion for defending cases involving loss of firearm rights or use of guns in self-defense. As one of WA's top criminal lawyers I can help you if your facing criminal charges as serious murder or even a simple probation violation. I'm Schöen Parnell (pronounced "Shane") and I've been a criminal lawyer for more than 17 years. Before opening my criminal defense law firm in 2002, I was the lead trial lawyer for one of the busiest DUI defense law firms in Washington. I have the experience and trial skills to provide the effective representation you need. If the prosecutor does not offer us a deal that is acceptable to you, I will not hesitate to take your case to trial. As my client, you will feel the weight on your shoulders lift as I step in to take over your case. I will give you my personal e-mail address and cellphone number to contact me after hours if you have a question about your case. I know that this is quite possibly the most difficult and embarrassing situation you have ever found yourself in. I will stand by you and fight for you. That is what I do, and I love doing it.